No matter what your reason for attending an exhibition is your ultimate goal will almost always be for your booth to stand out in the crowd. While experienced trade show staff and an exciting product help, the design of your exhibit is without a doubt the biggest attention grabber for you to utilise. Effective exhibition stand design not only includes the actual printed design but also encompasses everything else about your booth such as the layout, accessories and interactive technologies such as iPads. Before you start to think about your design you need to build a marketing plan, this is ideally done around six months in advance of the exhibition to give yourself and everyone else plenty of time. In this plan you should define clear marketing objectives for the show such as generating leads or promoting a new product you are about to launch, this will help you to design your exhibition stand. Outlining a plan beforehand allows you to create an eye-catching design around your marketing message. For example if your objective is to generate sales leads then you may want to include more in-depth information in the design whereas if you’re aiming to promote a new product then large detailed images of the product you are launching may help to draw the attention of attendees. Firstly we will receive a design brief from you which will then be passed on to a member of the graphic design team, from here the designer will contact you directly to discuss the project further. The designer will then be able to give you an estimated time scale for your requirements. Following your brief and guidelines the designer will then go on to create a concept for your artwork. Once a draft has been completed an artwork proof will be sent to you, you then have the opportunity to make any changes to the design. Our design team are always happy to make amendments to the design if required and this step allows us to ensure the end result exceeds your expectations. Once the final proof has been signed off by you, the design will then be sent to print. 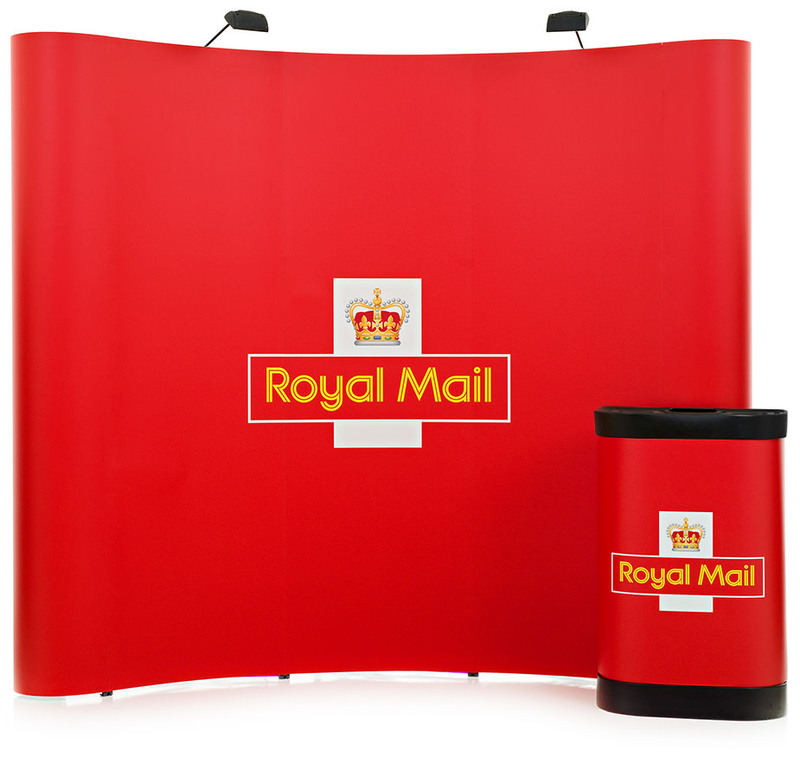 We print and manufacture all of our pop up stands, banner stands and table cloths in house which gives us full control over the quality of each printed product. We always pre-assemble your exhibition stand to guarantee the final product is to the highest standard. 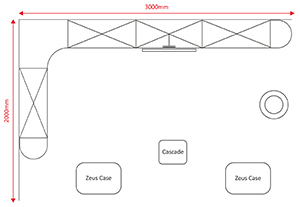 When designing a portable display such as a pop up you should download the artwork specification of the correct size from the corresponding product page on our website. This will give you the exact size to design and will also show where each panel begins and ends. When designing a pop up display it is important to remember that the end panels are ‘D’ ends, this means that these panels will curve around and any artwork on these panels may not be visible when viewing the display from the front. Some other tips for designing pop ups are to use images in the highest resolution you have available and also to keep any text to a minimum. Modular exhibition stands are made up of various different parts, for example you could have multiple pop up displays connected to one and other to create more interesting shapes than a single pop up would allow for. They can also include different structures such as archways and hanging displays which allow for more innovative design. Although the shape of the exhibition stand itself may be more intricate, the same principals apply as with pop up displays. For example text should again be kept to a minimum as passing attendees won’t take the time to stop and read and only high resolution images should be used. Custom exhibition stands offer similar versatility to modular exhibition stands in terms of design however they aren’t interchangeable as modular stands are. This means that bespoke exhibition stands are often one time use or have a generic design that can be used no matter what your marketing message is, this should be taken into account when designing your exhibit. Research suggests that you have around 3-5 seconds to grab the attention of passers-by, this means that if you’re exhibition design is a wall of text the likelihood is that people aren’t going to take the time to stop and read it. Therefore it is important to make sure images used are relevant to your business and are of a high resolution and text should be used in small amounts, large enough to read from a short distance away. When designing your exhibition stand you should be aiming for something easy to take in and memorable at the same time. You can also make use of interactive equipment such as iPads and TVs with various media playing to engage the attendee, for example you could have a short video that is professionally shot showing how your product works, and this would make your stand more memorable and offer helpful information that would encourage the attendee to convert into a customer. Does your stand represent your brand? Your exhibition stand should represent your brand and the messages that you promote, contradicting your brand could cause confusion. For example if you are an environmentally friendly business that sells handmade organic products then you may confuse attendees if you have an exhibition stand that’s looks metallic and futuristic. Creating a brand experience allows you to take advantage of the immersive environment by creating an experience that engages your audience. During the planning stages you should have defined who you’re target audience is or even better a profile of your target audience. You should always keep this in mind when it comes to the design stages of your exhibition stand as you want your stand to appeal to that group of people as much as possible. An example of this may be that if your target audience is of the younger generation you choose to use more bright colours as well as incorporating more technological features such as iPad’s and using social media. If you’re struggling to plan the design and layout of your exhibition stand then we can do this for you. 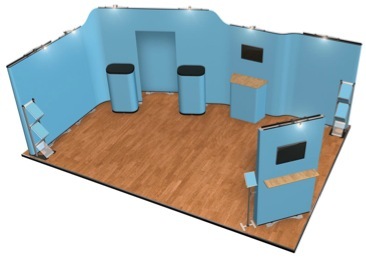 Floor plans are a free service we offer in which we will create a top down view of your exhibition stand with all the features laid out in the most effective manner, this includes everything from the stand itself to the accessories and furniture. For this service you need to provide us with the size of your exhibition space as well as the budget for the exhibition stand, this allows us to create the most effective exhibition stand possible in your price range. There are many accessories available no matter what type of exhibition stand you have, from a pop up display to a fully custom exhibition stand. Lighting is perhaps the most important accessory you can have as they light up your design allowing attendees to properly view and appreciate your exhibition stand, they can also be used to in conjunction with shelving units to put a spotlight on products you are promoting, drawing attention directly to them. Other accessories that help to improve the aesthetic of your exhibition stand include monitor brackets which allow you to promote your brand and business through the use of audio and visual content and counters which create a point of contact between the staff and attendees whilst also offering space for more design. Our business development managers are on hand to visit exhibition venues around the country to provide you with a face-to-face consultation on the design of your exhibition and how we can help you make the most of the space you have available. 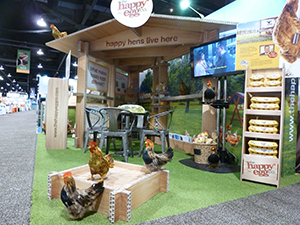 We hope these tips help you to design an effective exhibition stand for your next trade show. At XL Displays we create, design and build pop up displays, roller banners and exhibition stands that get you results.